Did you know H. Upmann was a banker? The story goes that German bankers Herman (H.) and Carl Upmann traveled to Cuba in 1844 to start a new branch of the Upmann family's bank. While there, they crafted an exceptionally unique cigar and locked it in the vaults to give out as special gifts to the bank's most important clients. The bank may be no more, but the H. Upmann cigar brand lives on and is renowned throughout the world for its great Cuban and non-Cuban cigars. 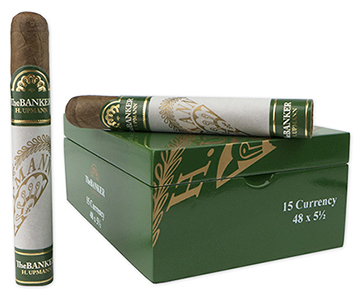 Enter 'The Banker' 170 years later ~ a cigar line that pays homage to the beginnings of the H. Upmann legend. Using Cuban-seed tobaccos to recreate the original blend, the rich and robust The Banker is blended with aged Nicaraguan and Dominican fillers, Nicaraguan binder from the Jalapa region, and a dark Ecuadorian Habano wrapper. This bold and tasty cigar offers plenty of smoking enjoyment with a sweet aroma and well-balanced notes of coffee, toast, nuttiness, leather, and spices ~ all without "breaking the bank." There, we said it.